At Cumberland Lodge , the residence of Prince and Princess Christian , the silver wedding presents were impressively displayed in several of the best rooms. There is nothing especially striking or even beautiful about the architecture of Cumberland Lodge, where "the Christians" have resided for the past sixteen years, and the restored portion (rebuilt after the fire of 1869) has evidently been erected with an eye to economy. But within, everything is homely and substantial. 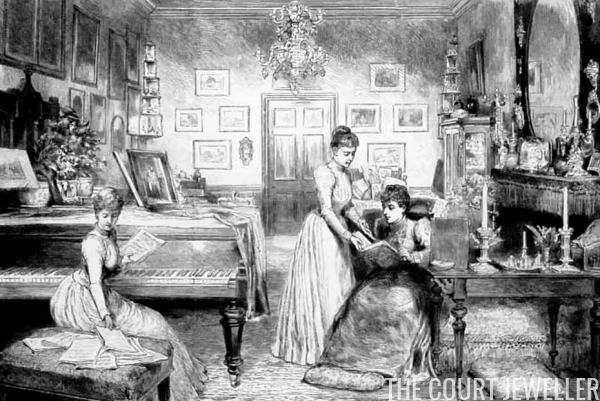 The Princess Christian delighted in unpretentious surroundings; and to this love of simplicity and homeliness must be attributed the esteem and regard in which both she and her husband are held. This has been abundantly illustrated by the congratulations and presents which have been showered upon the Prince and Princess on the celebration of their silver wedding  and on the happy marriage of their daughter . Prince and Princess Christian gave a tea party on Saturday, July 18, at Cumberland Lodge to the children of the Queen's Schools in Windsor Great Park, the entertainment being in commemoration of the recent royal wedding. Princess Christian received at Buckingham Palace on Tuesday, July 21, about 100 ladies, representing 2000 contributors to a handsome present in the shape of a tiara of diamonds, to commemorate her silver wedding. The tiara had been previously presented privately by the Countess of Arran , in order that the Princess might be able to wear it at her daughter's marriage. 1. Cumberland Lodge is a country house in Windsor Great Park; originally built in 1650, it has been home to numerous royals, including Prince Augustus, Duke of Sussex and Prince and Princess Christian of Schleswig-Holstein. Today, the house is the headquarters of a charitable foundation. 2. Prince Christian of Schleswig-Holstein (1831-1917) and Princess Helena of the United Kingdom (1846-1923). He was a son of Duke Christian August of Schleswig-Holstein-Sonderburg-Augustenburg; she was the fifth child of Queen Victoria and Prince Albert. 3. 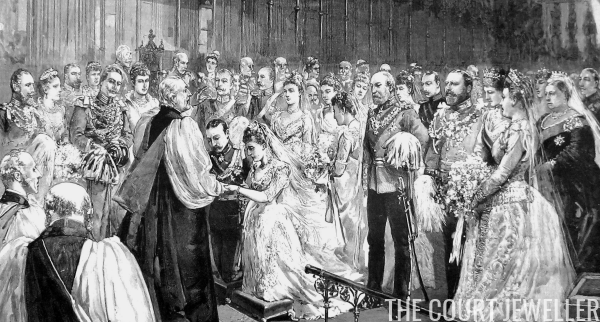 Prince Christian and Princess Helena were married at Windsor Castle on July 5, 1866. You can read a bit about their wedding (and controversy surrounding their engagement) in our post here. 4. The adjective "happy" doesn't exactly apply here, unfortunately. Princess Marie Louise, Christian and Helena's younger daughter, married Prince Aribert of Anhalt at St. George's Chapel in Windsor on July 6, 1891 (one day after her parents' silver wedding anniversary). The marriage was a disaster. Scholars have debated the exact cause of the strife, but many suspect that Aribert was gay. In 1900, Aribert's father, the Duke of Anhalt, suddenly annulled the marriage while Marie Louise was out of the country on an official visit to Canada. Neither Aribert nor Marie Louise ever remarried. She remained an important member of the extended British royal family until her death in 1956. 5. 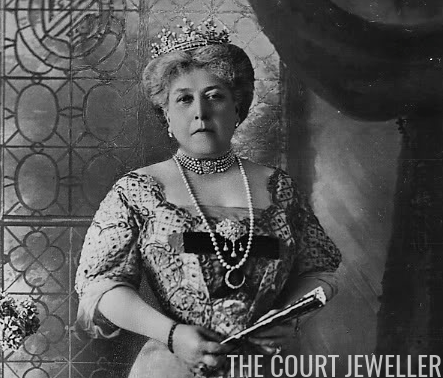 The tiara in question was reportedly a convertible diamond and pearl tiara/necklace; it may be the one that Helena is wearing in the photograph at the top of the post. Winifred Gore, Countess of Arran was one of Helena's ladies-in-waiting. She was the second wife of the 5th Earl of Arran.